My recent handy work is out in the wild in the form of the Swap It Don't Stop It iPhone app for a new Australian Government health campaign. The Swap It Don't Stop It campaign is all about educating and encouraging people to swap unhealthy food and unproductive activities for those that can improve your overall health & fitness. 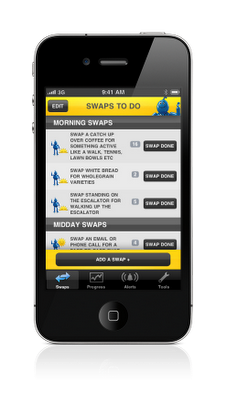 The iPhone app provides a tool for tracking your "swaps", gaining achievements, receiving alerts to be reminded when to swap, tracking food swaps (with an integrated shopping list) and finding healthy activities near you. The app looks really great and is free on the Australian App Store. I was very happy with how it turned out. I developed the app on behalf of the great guys at Millipede Creative Development and JWT Melbourne.